The Padres off-season was filled with many question marks after a surprising 2010 campaign where they won 90 games and finished 1 game back of the Giants in the NL West. The off-season started off slowly for the Padres, and quickly for everyone else. There were many free agents going to new teams very early, which Padres GM Jed Hoyer did not expect. “This offseason surprised me. I thought we’d be doing most of this stuff in January, but it went quick, and it was expensive. Our shopping got moved up because we moved Adrian.” I have not written an entry in a while, so I am going to examine the Padres moves so far this off-season, with less than a month until pitchers and catchers report. The first move Hoyer made was dealing Edward Mujica and Ryan Webb to the Marlins for young talented outfielder Cameron Maybin. You can read about this move right Here. Casey Kelly is a young and talented minor league pitcher who was rated the #1 Red Sox prospect in 2010 and the 24th best prospect in major league baseball by Baseball America. He actually turned down a scholarship to play football at the University of Tennessee to play baseball. He played shortstop for the first half of his minor league career, then turned to the other position he was drafted for, pitcher. Anthony Rizzo is a good story. He is a cancer survivor who was drafted in the 6th round of the 2007 draft. Last year, he hit 20 HR and drove in 80 RBI’s in AA. He had a chance, if not traded, to make the jump over Lars Anderson as the next 1st baseman for the Red Sox. He was traded and figures to be the Padres starting first baseman in 2012. Reymond Fuentes is the sleeper in the deal. He is the younger cousin of Mets OF Carlos Beltran. Reymond can play all OF positions, and can fly. He has some wheels. In Single A he hit .270 while stealing 42 bases. He may be 2-3 year away from the big leagues, but if he pans out the Padres have a gem on their hands. Eric Patterson was the PTNBL of the deal. He figures to be on the Padres big league club in 2011 as a utility player. This Adrian Gonzalez deal is interesting. It’ll only be a matter of time until we see who wins this deal. Right now the clear winner is the BoSox. But in a few years, that may be a different story. 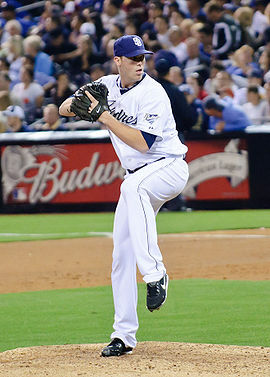 The Padres signed Dustin Moseley a few months later, more than likely to replace Edward Mujica in the Friars bullpen. He can make a spot start here and there, and also be a long-relief man if needed. Then, a few days later, the Padres swung a deal for Rays SS Jason Bartlett, who did not figure to be in the Rays’ future plans. Brandon Gomes, Adam Russell, Cesar Ramos, and Cole Figueroa. Ramos and Russell had a few stints with the big league club this past year. Brandon Gomes has good stuff and was probably the key to the deal. Cole Figueroa is a young infielder with not much power but is patient at the plate. He has a decent arm and a good glove. He projects to be a 2nd baseman. Jason Bartlett gave the Padres what they had been needing for a few years ever since Khalil Greene was traded- a solid defender, a veteran shortstop, and a solid bat. The left side of the infield was set with Headley and Bartlett at 3rd base and shortstop respectively. But the right side of the infield was a question mark. Hoyer then surprised everyone, agreeing to a 2 year, 11 million dollar contract with the O-Dog, Orlando Hudson. Hudson was coming off a decent year with Minnesota, and was looking for a multi-year deal. The Padres gave him one. The middle of the infield was set. Now, trying to find a first baseman was Jed Hoyer’s main priority. The Padres offered Derrek Lee 8.5 MM, but he declined, signing with the O’s. Adam LaRoche had signed a deal with the Nationals. First baseman/s were going off the market quickly. Jed Hoyer decided to sign Brad Hawpe, who was coming off a down year, for around 2.5 MM. Hawpe had been a 1st baseman originally, but had to play OF because Todd Helton was blocking him at 1st base. He had always wanted to be a starter at 1st base, and he got his chance with the Padres. Just today, the Friars have locked up Jason Bartlett thru 2012 on a 2 year deal. The middle infield will be together for a while, it everything goes according to planned. On a non-baseball note, did anyone else see my Packers ballin yesterday! Go Pack Go!!!! On Saturday afternoon, the Padres dealt young right handers Ryan Webb and Edward Mujica to the Marlins for young, talented outfielder Cameron Maybin. The Padres went into their deepest position and talent to cover one of their needs this off-season. Maybin was drafted 10th overall out of high school by the Detroit Tigers in 2005. He was the 2004 baseball america high school player of the year. He had fantastic success in the Minor Leagues, but has struggled in 548 career big league at bats. Maybin has loads of potential, and I’m talking all star potential. He has all 5 tools, but they are very raw, as you can expect. He is only 23 years old. If he did not enter the draft out of high school and went to college instead, in 2011 he will only be in his 2nd pro season. There are a few flaws in Maybin’s game, though. Cam has trouble making contact as a big league ballplayer. He only makes contact 81 percent of the time when the ball is in the strike zone, compared to the league average of 88 percent. His defense is sometimes suspect, but he has loads of range. Maybin also has a 3.10 range factor last year, highest in the big leagues. Now let’s take a look at this deal from a Marlins perspective. It’s apparent that they wanted to rid of any thing that had to do with the Miguel Cabrera blockbuster they pulled off a few years ago, as they also dealt Andrew Miller earlier this week. What the Marlins got were 2 good, solid bullpen arms for Maybin. Ryan Webb has nasty stuff, and will fit in well for the Marlins. Mujica has trouble giving up home runs, but overall he is a solid pitcher. My take? I think the Padres got a steal. They didn’t deal from their core bullpen guys, and they got a great talent in return. The upside is HUGE with Cameron Maybin. If you look at his stats, you may go, “eh.” But he is only 23 years old. A great talent, and if he can put it together and grow into a big league ballplayer with the Padres, it’ll pay some pretty huge dividends. Time will only tell if this trade was successful or not, but right now, I like it.